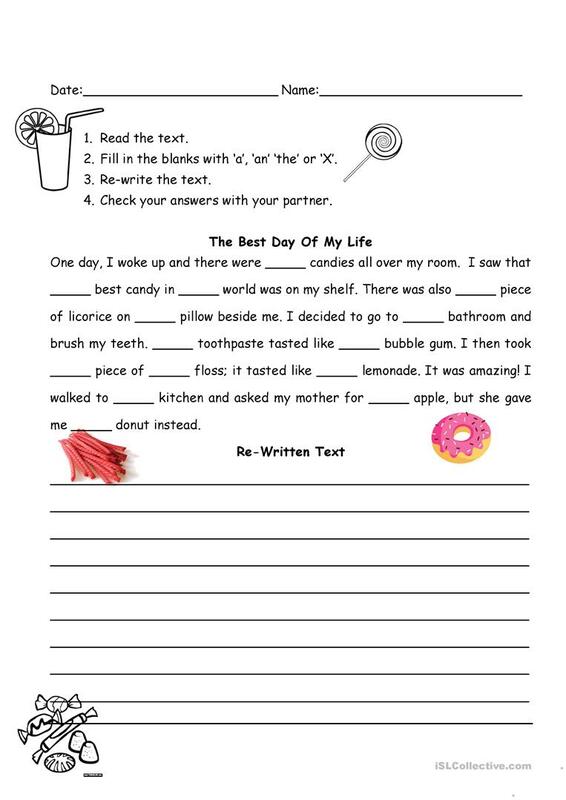 This is a short and fun worksheet for students. They must fill in the blanks witht he appropriate articles and then need to copy the whole text in the appropriate space. The above downloadable handout is intended for elementary school students and kindergartners and nursery school students at Elementary (A1) and Pre-intermediate (A2) level. It is aimed at practising Articles, Articles: definite article and Articles: indefinite article in English, and is a valuable material for strengthening your pupils' Writing skills. lylylaml is from/lives in Canada and has been a member of iSLCollective since 2015-03-28 20:40:52. lylylaml last logged in on 2018-02-13 00:09:28, and has shared 2 resources on iSLCollective so far.